There won’t be an eighth Monster Energy NASCAR Cup Series title for Jimmie Johnson this year. 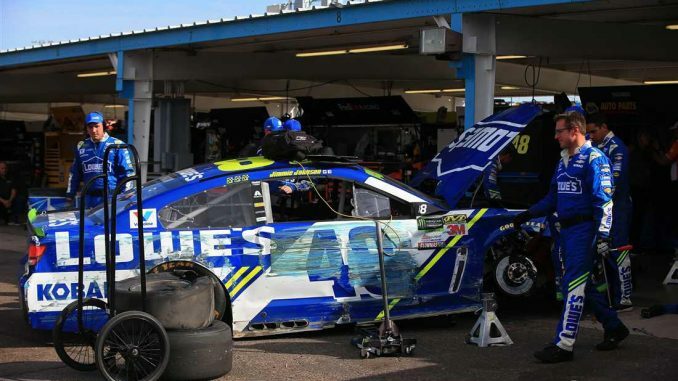 With less than one lap left in the second stage of Sunday’s Can-Am 500 at Phoenix Raceway, the cutoff race for next Sunday’s Championship 4 finale at Homestead-Miami Speedway, Johnson popped his right front tire as his No. 48 Hendrick Motorsports Chevrolet barreled into Turn 3 at the one-mile track. Hard contact with the wall knocked the seven-time champion out of the race in 39th-place, ending the title run for a driver who need nothing short of a victory at Phoenix to advance to the final round of the Playoff. “I really didn’t have any warning,” Johnson said after exiting the infield care center. “I knew I was hard on the brakes, but the run before we didn’t have any issues reported back. So I felt like I was kind of doing the same thing. Unfortunately, with so few laps to go to the end of the stage, as soon as I went in the corner and touched the brakes, the right front just blew. Even without the accident, Johnson would have faced an uphill battle. He entered Phoenix eighth in the Playoff standings, needing a win to advance. Johnson finished 10th in the first stage and was running 11th on Lap 150 when he hit the wall. “The last couple of months we’ve been staying alive, with the Round of 8, and then the Round of 4, you can’t just stay alive,” Johnson said. “You’ve got to be hitting on all cylinders, and we just haven’t been there, unfortunately.